Nearly 2,000 civilian vehicles, which were left stranded on Jammu-Srinagar national highway following a massive landslide, were cleared as the two-day per week ban on movement of civilian vehicles on the only all-weather road linking Kashmir with rest of the country came into effect on Sunday, officials said. 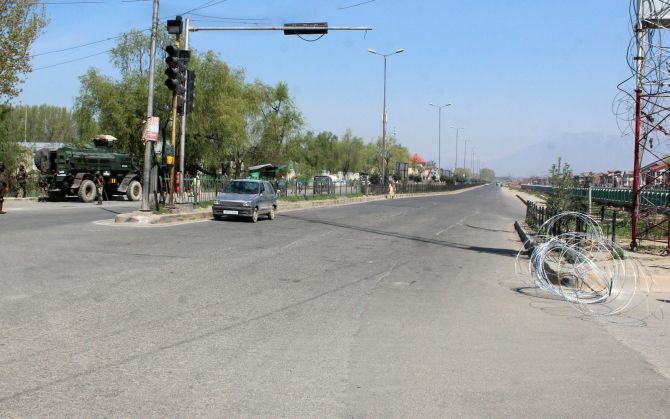 The governor administration last week announced a ban on civilian traffic on the 270-km highway on Sundays and Wednesdays to facilitate safe passage of security convoys till May 31, a decision which was criticised as 'anti-people' and 'undemocratic' by almost all political parties and cross-section of the society including business community in the valley. 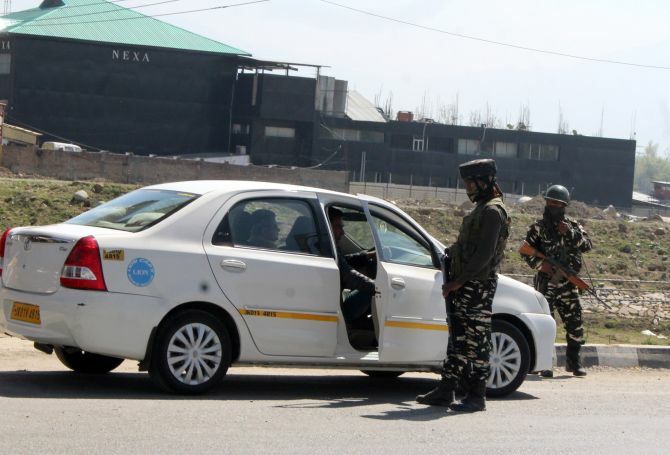 IMAGE: Army, police and CRPF personnel have been deployed at all intersections leading to the highway to ensure that civilian traffic does not interfere with movement of convoys of security forces, officials said. 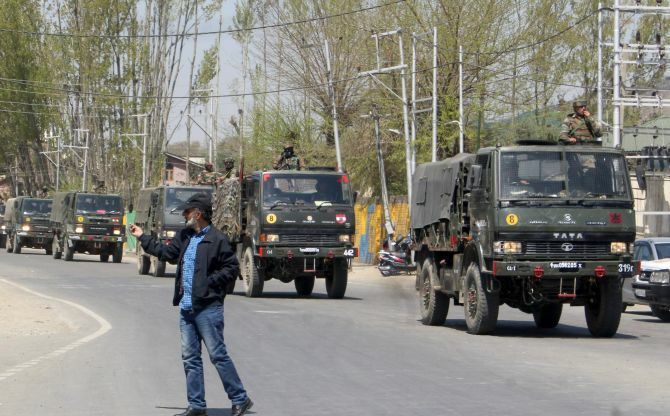 The decision comes in the aftermath of the Pulwama terror attack, besides another attempt to target a Central Reserve Police Force convoy with a car bomb on the highway near Banihal in Ramban district on March 30. A massive landslide blocked the highway near Anokhi fall in Ramban district on Saturday afternoon, leaving nearly 2,000 Jammu-bound vehicles stranded. IMAGE: Concertina wires and barricades have been put on roads connecting the highway in order to prevent the movement of civilian vehicles. "The highway was cleared of the debris around 3 am after hectic 14-hour long operation and accordingly, the stranded vehicles were allowed to move towards Jammu," Deputy Superintendent of Police, traffic (National Highway, Ramban), Suresh Sharma told PTI. He said it was decided that the stranded civilian vehicles, both trucks and passenger vehicles, would be cleared first before the highway is closed for the civilian traffic to ensure smooth passage of the security convoys. IMAGE: Army convoy moves on the highway. 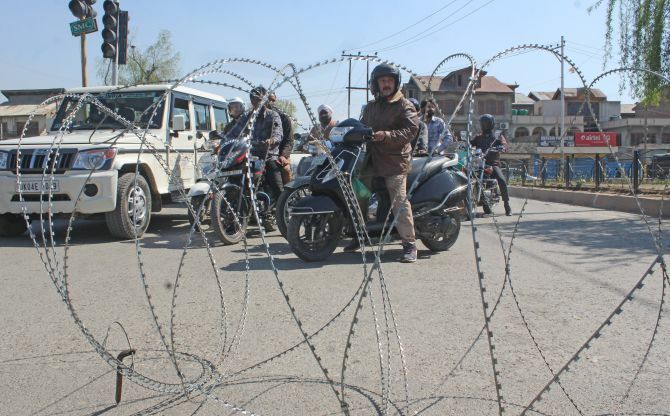 However, the officer said no fresh civilian traffic was allowed either from Srinagar or Jammu since this morning in view of the restrictions which are in force from 4 am to 5 pm. "The security convoys started moving from both sides to reach their destinations," Sharma said. 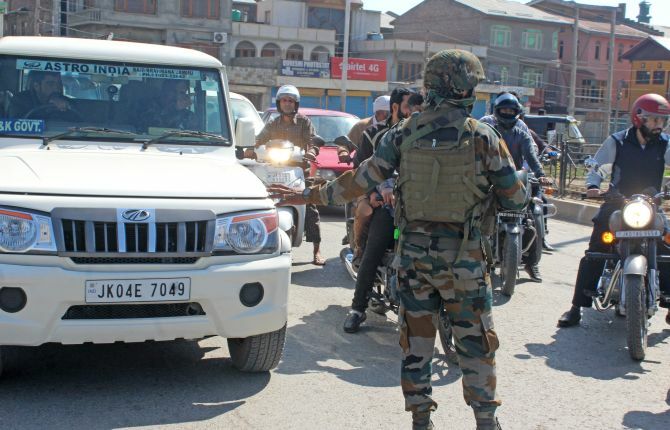 Army, police and CRPF personnel have been deployed at all intersections leading to the highway to ensure that civilian traffic does not interfere with movement of convoys of security forces, officials said. Amid public outrage against the curbs, the authorities earlier clarified that patients, students, tourists and others in emergency will be allowed to move after scrutiny during the restrictions. 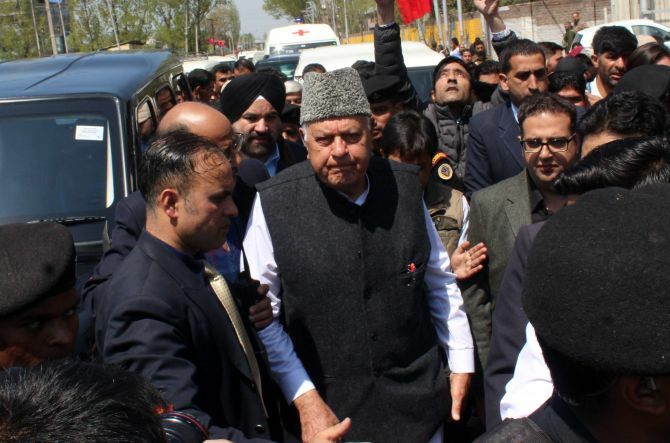 IMAGE: National Conference president Farooq Abdullah visits the highway to take part in a protest. Ghulam Mohammad Bhat started off from his home in Srinagar to reach a hospital where his daughter is admitted, but cannot find any means of transport to get there due to the ban on civilian traffic on the highway. "I have been walking for the past 15 minutes, but there is no public transport in sight. I have to reach JVC hospital (SKIMS Medical College and Hospital, Bemina), where my daughter is admitted," Bhat told PTI near Tengpora bridge as he braced himself for another hour of walk. Concertina wires and barricades have been put on roads connecting the highway in order to prevent the movement of civilian vehicles. The Army, police and CRPF personnel have been deployed in strength to ensure that the ban in implemented in letter and spirit. However, the scale of inconvenience caused by the ban order has just started to come to the fore as dozens of people can be seen at each intersection, pleading the security forces to allow them to cross to the other side of the highway. IMAGE: People's Democratic Party members protest on the highway. There were people who had patients in the vehicles and wanted to take them to hospitals or parents accompanying their children on way to tuition ahead of the various competitive exams due next month. A groom from Anantnag district, who got married in Doda district on other side of the Jawahar Tunnel, had to obtain permission from the authorities concerned to take his wedding entourage to the bride's home. Danish Ali, a resident of New Qazibagh in Anantnag, got the permission for himself and his 12 companions to travel on the highway on Saturday and Sunday, but only after the entourage was put to proper frisking and security check. Pained by the scenes, a urologist decided to cycle his way to his hospital instead of travelling in an ambulance, which have been exempted from this ban order. "I decided to use the cycle so that I can feel the pain of the people, what they are going through because of this order. I am not going to get into arguments with anyone if I am stopped. I will change my way and pedal on," Dr Umar said. IMAGE: The highway bears a deserted look. Umar said roads were the lifeline of any place and shutting them down meant shutting down the city, state or the country. Politicians were quick to lambast the ban order, with former chief minister Omar Abdullah terming it mindless. 'Driving to Uri I'm getting to see first hand the extent of disruption and inconvenience that is being caused to people because of the mindless highway closure order that is in place today,' Abdullah tweeted. People's Democratic Party president Mehbooba Mufti said her party would not allow Kashmir to be turned into an 'open air prison'. 'This is Kashmir, not Palestine. We wont allow you to turn our beloved land into an open air prison. Jis Kashmir ko khoon say seencha, woh Kashmir humara hai (the Kashmir we have nourished by our blood, is ours),' Mufti tweeted. People's Conference chairman Sajad Lone said the highway ban was turning into a 'humanitarian disaster'. 'Flooded will (with) calls from across the state. People in dire need to travel in order to tend to their day to day needs of survival stuck in a state of helplessness. @jandkgovernor urgently needs to scrap the inhuman order,' Lone tweeted. Several PDP leaders, led by former MLA Sonawar Mohammad Ashraf Mir, tried to defy the ban order by travelling on the highway, but were stopped by police at the Athwajan crossing. "People are being harassed.... 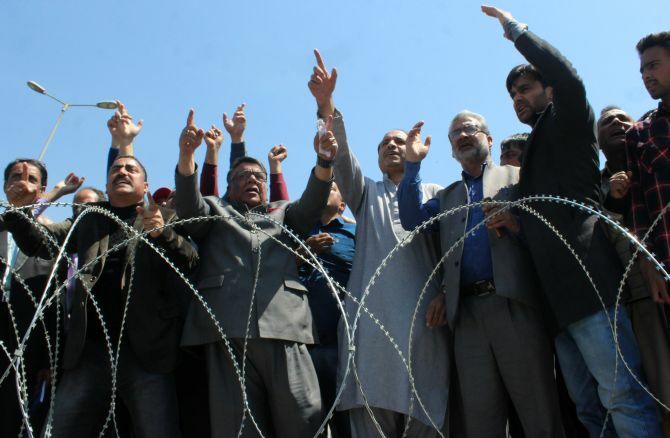 This is terrorism by the governor's administration to ban movement of people two days every week," Mir told reporters. Were terrorists tipped off about CRPF troop movement?